Beirut, the capital of Lebanon, is one of the most religiously, culturally and economically diverse cities in the Middle East. More than one third of Lebanon’s total population of approximately 6 million people resides in the Greater Beirut area. 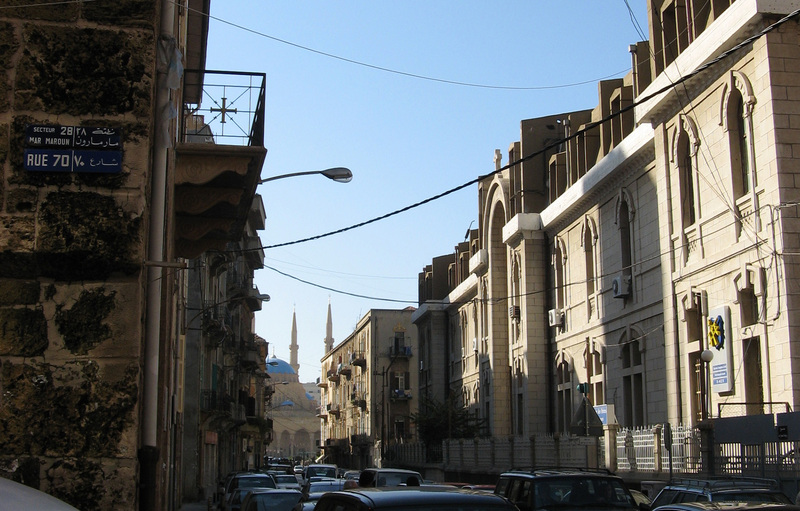 Beirut is a city of neighbourhoods, most with a relatively homogeneous politico-religious and socio-economic character. Relatively few areas are genuinely mixed, at least not on the residential level. This is to a large extent a result of the civil war (1975-1990), during which the city was violently divided into East Beirut (almost exclusively Christian) and West Beirut (predominantly Muslim), as well as into a number of further subdivisions. Municipal Beirut is rather compact, covering an area of approximately 18 square kilometres. It is bounded by the Mediterranean Sea to the west and north and the Beirut River to the east. Going west to east, Beirut’s southern border runs in more or less a straight line from the southern end of the Ramlet El-Bayda public beach to the southern edge of the Pine Forest, excepting a slight dip below the Chatila Roundabout, and then meanders northeast just to the south of the National Museum and the Hotel Dieu hospital, before meeting up with the Beirut River. 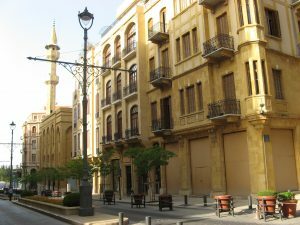 Beirut has a unique administrative status: it is the only municipality (بلدية) in Lebanon which is also a governorate (محافظة). Beirut Municipality Building, built by Youssef Aftimus in 1927. Municipal Beirut is divided administratively into 12 quarters and 60 sectors. *Note that رأس is pronounced راس in Lebanese Arabic. The 12 quarters of Beirut (a derivative of Beirut Districts by Elie plus, licensed under the Open Database License). 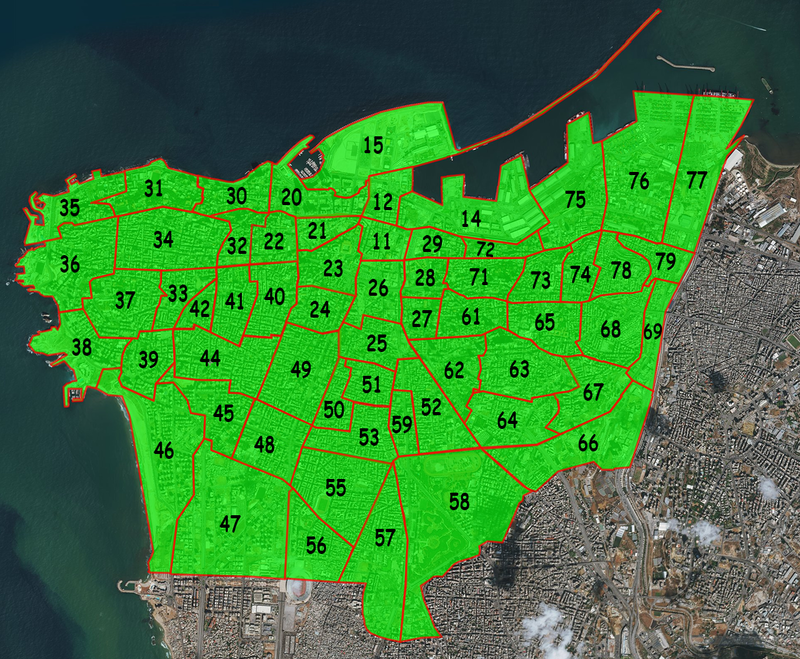 Beirut’s quarters are subdivided into sectors, each with their own official number, as shown in the following map. A complete numbered list of the sectors follows the map. **Note that صَنائِع is pronounced صَنايِع in Lebanese Arabic. 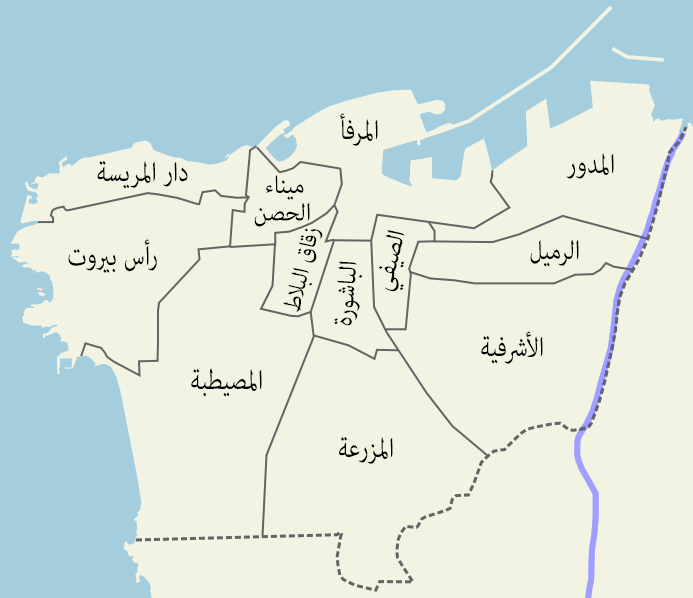 Oddly, there are two sectors which are not officially located within the quarter whose name they share: the Ras Beirut sector (sector 35), which is in the Dar El-Mreisseh quarter (not the Ras Beirut quarter), and the Rmeil sector (sector 72), which is in the Medawar quarter (not the Rmeil quarter). There are blue signs posted on walls and buildings all over Beirut, showing the sector name and number as well as street number. The historic core of Beirut is essentially what is today the Nejmeh and Majidieh sectors (11 and 12). (Most of the Nouveau Secteur (15) is recently reclaimed coastline.) Take a look, for example, at this map from 1841, when Beirut was still a small Ottoman port city. After this time, as growing trade with Europe rapidly transformed it into a major commercial centre, Beirut began to expand outside its old city walls. This process was accelerated by major infrastructure projects such as the construction of the Beirut-Damascus Road, completed in 1863, which consolidated Beirut’s trade links to Mount Lebanon and the Syrian interior as well as facilitating the arrival of new immigrants to the city. The population of Beirut increased from about 10,000 in 1840 to 80,000 by 1880. By the end of the 19th century, the city had expanded into such areas as Saifi, Bachoura, Mina El-Hosn, and the culturally vibrant neighbourhood of Zuqaq El-Blat. Meanwhile, wealthy families began to build grand villas overlooking the city from the east, giving their names to places like Medawar and (Rue) Sursock. Video: Beirut 1840-1898 (Part 1), from Beirut Heritage تراث بيروت on YouTube. Video: Beirut 1840 – 1899 Part II بيروت في النصف الثاني من القرن التاسع عشر, from Beirut Heritage تراث بيروت on YouTube. The population of Ottoman Beirut historically consisted mainly of Sunni Muslims (the single largest community) and Greek Orthodox Christians, but this would change as the economic rise of the city in the mid 19th century attracted rural migrants from Mount Lebanon and the Syrian hinterland. The demographic composition of the city was significantly altered by a massive influx of Maronite Christian refugees fleeing civil strife in Mount Lebanon in 1860. But even today, the notion that Sunnis and Greek Orthodox are the “authentic” Beirutis is deeply-ingrained in the popular imagination. Many residents of Beirut, even those who were born in the city and have lived their whole lives there, still consider themselves (and are considered for official electoral purposes) to be from somewhere else. Maronites and Druze are often linked to places in Mount Lebanon, while most Shi’ites originate from places in the South or the Bekaa. Burgeoning educational institutions played an important role in the development of the city. In 1866, the Syrian Protestant College (renamed American University of Beirut in 1920) was established by American missionary Daniel Bliss in Zuqaq El-Blat, and relocated in 1873 to a large area on the northwest promontory of Ras Beirut. The presence of this sprawling university campus, which occupies the whole of the Jamia (“university”) sector (31), was the main impetus for the urbanization of adjacent areas such as Ain El-Mreisseh (30) and Hamra (34), and their acquisition of the liberal, cosmopolitan character for which they are well known. Bliss Street, named of course after the AUB founder, serves as the southern and northern boundaries, respectively, of the Jamia and Hamra sectors. Video: Soft Power: The US and the Middle East – Al Jazeera World, from Al Jazeera English on YouTube. On the other side of town, in what would become the Yesouieh (“Jesuit”) sector (27), the Collège of the Jesuits was founded in 1875 by the French Jesuit Father Ambroise Monnot (after whom Monnot St. is named). 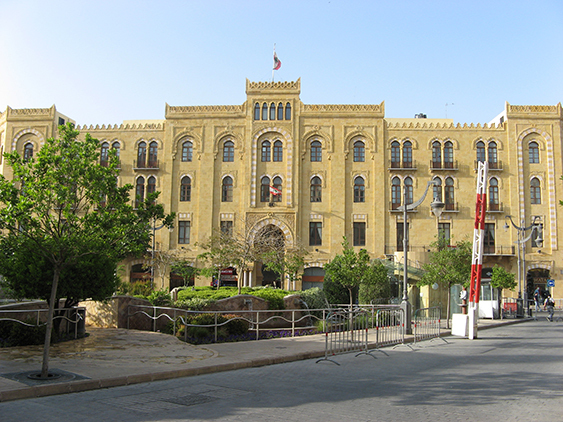 This institution, renamed Université Saint-Joseph in 1881, served to connect the Downtown area with the emerging suburb of Achrafieh. A number of other neighbourhoods were named after educational institutions and hospitals. For instance, the Batrakieh sector (24) took its name from the Greek Catholic Patriarchal College (founded in 1865), the Nasra (“Nazareth”) sector (62) took its name from the Collège Notre Dame de Nazareth, established by the French Catholic Dames de Nazareth (founded in the 1870s), and Hikmeh (“Wisdom”) (73) took its name from the Collège de la Sagesse (founded by the Maronite bishop of Beirut in 1874). The Hôpital Orthodoxe sector (74) took its name from the Greek Orthodox St. George Hospital (founded in 1878, but established on its current site in 1913), while the Hôtel-Dieu sector (64) took its name from the Hôtel-Dieu de France, established in 1923. Beirut ca. 1900 (General view, with Lebanon in the distance, Beyrout, Holy Land, (i.e., Beirut, Lebanon), from the Library of Congress Prints and Photographs Division Digital ID ppmsca.02663), Public Domain. In the first decade of the 20th century, local authorities successfully established a planned neighbourhood in a sand-strewn area to the west of the city. This neighbourhood included a hospital, public garden, mosque, and (to some extent in reaction to the growing influence of the missionary schools) a vocational institution. This school, l’École des Arts et Métiers (مدرسة الصنائع والفنون), would give its name to the present-day sector of Sanayeh (41), i.e. 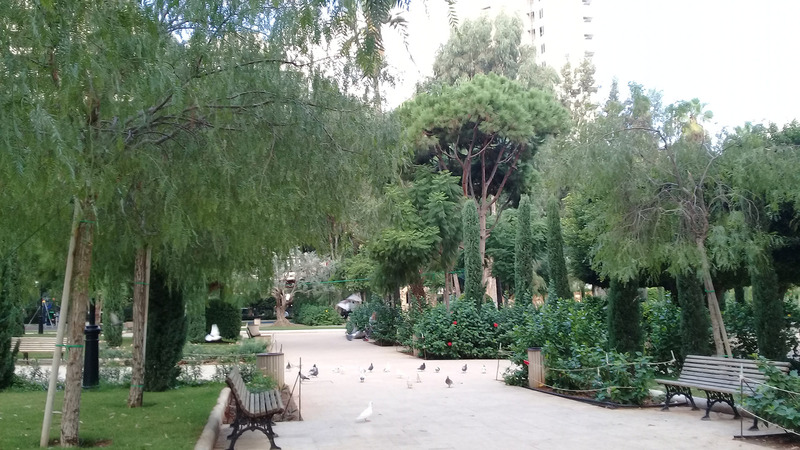 “creations”, and the recently renovated public garden (now officially renamed René Moawad Garden, but still popularly referred to as Sanayeh Garden). The development of Beirut outside its centre was further galvanized by the establishment of a tramway service in 1908. Five lines connected the city centre with the growing outer neighbourhoods, including Ras Beirut to the west, Medawar and Rmeil up to the Beirut River to the east, and Ras El-Nabaa to the pine forest and even as far as the village of Furn El-Chebbak (outside the city limits) to the south. Video: إبراهيم مرعشلي ـ رزق الله عا إيامك يا ترامواي بيروت, from Beirut Heritage تراث بيروت on YouTube. 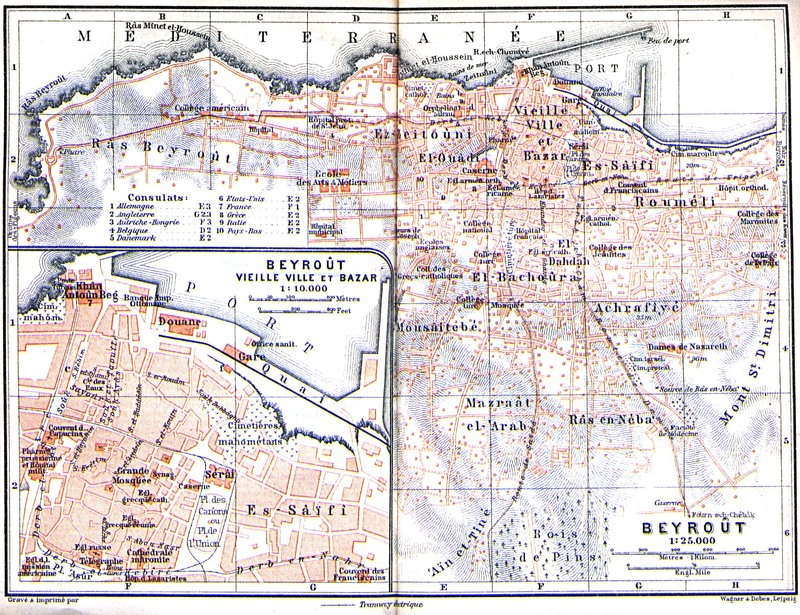 The present-day twelve quarters (أَحْياء) of Beirut were demarcated in 1921, a year after General Gouraud’s declaration of the state of Greater Lebanon. 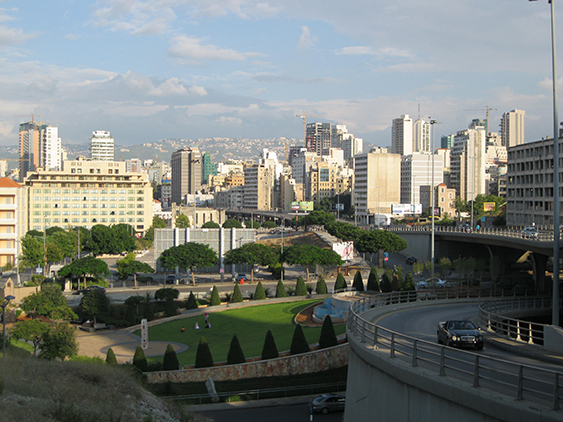 Beirut experienced significant population growth and modernization during the period of the French Mandate. Perhaps the most enduring mark of the French presence was the radial street plan of Place de l’Étoile, i.e. Nejmeh Square (ساحة النجمة), after which the Nejmeh sector (11) is named. The Parliament Building is located in this square. To the southwest, the former Ottoman barracks were converted into the seat of the French High Commissioner (this would later become the residence of the Prime Minister of Lebanon). This building, called the Grand Serail, gave its name to the Serail sector (23) of the Zuqaq El-Blat quarter. A number of prominent streets in Beirut are named after French figures of this period, including Clemenceau, Foch, Gouraud (also known as Gemmayze Street), and Weygand. The official boundaries and nomenclature of Beirut’s quarters and sectors do not always correspond to the mental maps of its residents and the names they use to designate areas of their city. Mentioned below are some of the more well-established popular mappings of Beirut. Downtown or “Centre-Ville” – also known as “Beirut Central District” or “Beirut City Centre” – essentially corresponds to the area whose post-war reconstruction was tasked to the real-estate company Solidere (Société Libanaise pour le Développement et la Reconstruction du Centre-Ville de Beyrouth), established in 1994 by assassinated former Prime Minister Rafiq Hariri. The Solidere Downtown includes the historic city core in the central part of the Marfaa (Port) quarter, as well as the eastern part of the Mina El-Hosn quarter, the northern edges of the Zuqaq El-Blat and Bachoura quarters, and the northwestern part of the Saifi quarter. The north and northwestern parts of the Marfaa quarter – i.e. 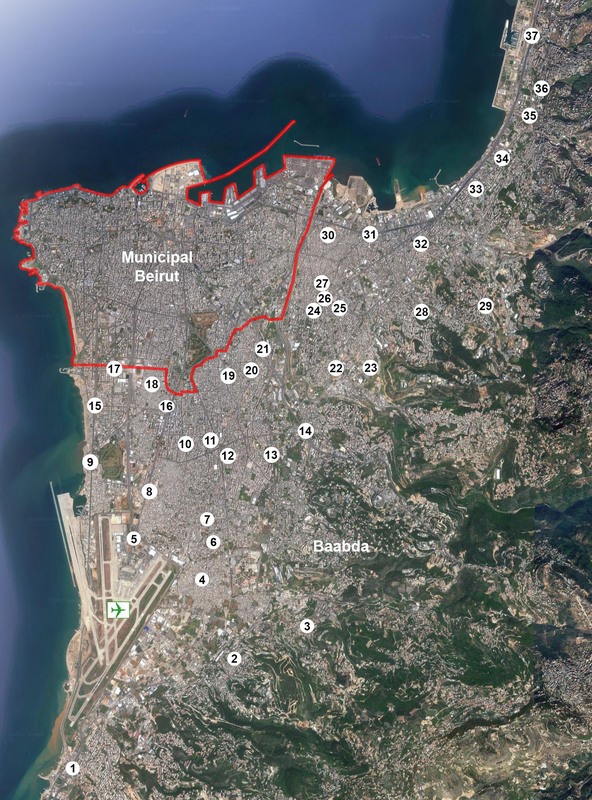 the Nouveau Secteur (or Beirut Waterfront, previously known as the Normandy Landfill) and Zaitunay Bay areas – are also under Solidere’s control, although some might not consider these areas to be part of Downtown. Historically a mixed residential and commercial space, Downtown Beirut is today virtually empty of residents, and the bustling popular markets of yesteryear have been replaced by shopping and dining establishments catering to the well-heeled. In common parlance, “Port” is reserved for the eastern part of the Marfaa quarter, which is where the actual Port is located and which has a very different feel than that of the glossy Downtown. Here is some fascinating 360-degree aerial footage of Downtown Beirut and surrounding areas shot by Maher Iskandar. Beit Beirut (also known as Beit Barakat and the “Yellow House”) in 2007, before its renovation and conversion into a museum. Perhaps the most significant and enduring – if mostly unmentioned – of Beirut’s unofficial boundaries is the infamous “Green Line” or line of demarcation. 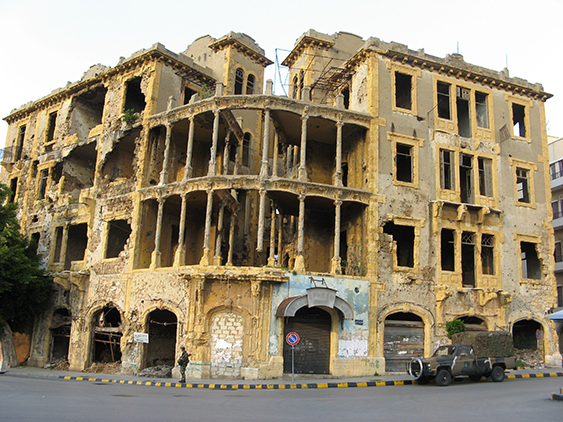 During the civil war, this was a no-man’s land of overgrown vegetation, bombed-out buildings and facades pockmarked with bullet holes which divided Beirut into East and West. Also known in Arabic as خط التماس (“line of contact”), it ran for much of its length in municipal Beirut along Damascus Road (roughly along the border separating Saifi from Bachoura and Achrafieh from Mazraa), and along the Old Saida Road in the municipalities of Chiyah and Hadath. The barricades and overgrown vegetation are long gone and reconstruction has erased most of the physical scars. However, the dividing line has been seared on the mental geography of Beirut residents, and continues to be reinforced by sectarian territorial markers such as banners of political leaders and religious symbols. Indeed, the demographic composition of the two sides has changed little since the war: most of those living to the west of the former Green Line are Muslim and most of those to the east are Christian. Even today, many Lebanese are apprehensive about crossing this invisible boundary. Achrafieh, officially a sector (63) as well as a quarter subdivided into ten sectors, is also a common designation of the neighbourhoods of the former East Beirut as a whole, i.e. the predominantly Christian neighbourhoods belonging to the Achrafieh, Medawar, Rmeil, and Saifi quarters. 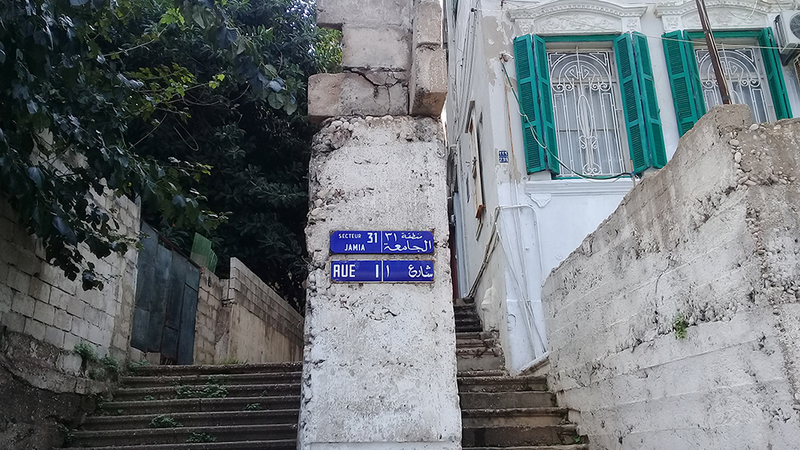 A westward view of the western edge of Rue Gouraud, also known as Gemmayzeh Street, which is officially the boundary between the two northern sectors of the Saifi quarter, i.e. Mar Maroun and Gemmayzeh (28 and 29), but is popularly considered a part of Achrafieh in the broad sense. In the distance is the Mohammad Al-Amin Mosque, located Downtown in the Nejmeh sector (11). Check out Achrafieh (in the broad sense) in this drone footage, again shot by Maher Iskandar. Video: Memories of Ras Beirut — Wish You Were Here, from dkeith95 on YouTube. Note that the popular understanding of Ras Beirut does not coincide with the official boundaries of Ras Beirut, neither the quarter nor the sector. 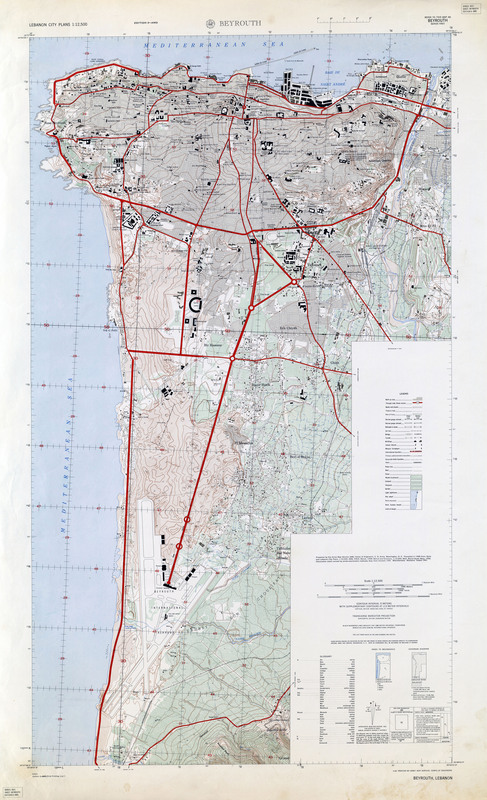 Opinions may differ to some extent, but Ras Beirut is typically considered as including the Hamra and Manara sectors, the Ras Beirut and Jamia sectors of the Dar El-Mreisseh quarter, and perhaps also at least part of the Ain El-Mreisseh sector as well. The American University of Beirut Neighborhood Initiative has produced a useful and informative map called Ras Beirut – Our Neighborhood. This map lists shops, restaurants and cafés, notable buildings, places for cultural and leisure activities, suggested walking routes, and more. Greater Beirut has no official boundaries. However, it is generally considered to extend at least as far as the airport to the southwest and Daoura to the northeast, with the imaginary line connecting these two points serving as an approximate eastern boundary. On some reckonings, Greater Beirut extends as far south as Damour and as far north as Jounieh, and includes places like Beit Meri and Aley in the mountains to the east. 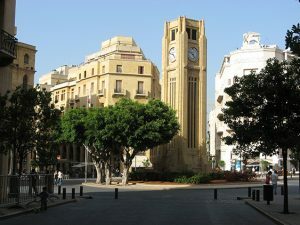 Although some effort has been made to plan the growth of municipal Beirut and its suburbs, such as the master plan of Michel Ecochard, central planning has played little role in the development of Beirut. The settlement of Beirut outside its municipal borders has instead owed much to various waves of immigration, particularly of refugees and other marginalized communities. 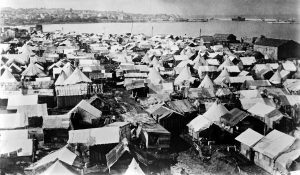 Refugee camp, Beirut (early 20th century), from the George Grantham Bain Collection (Library of Congress), Digital ID ggbain 35636, Public Domain. 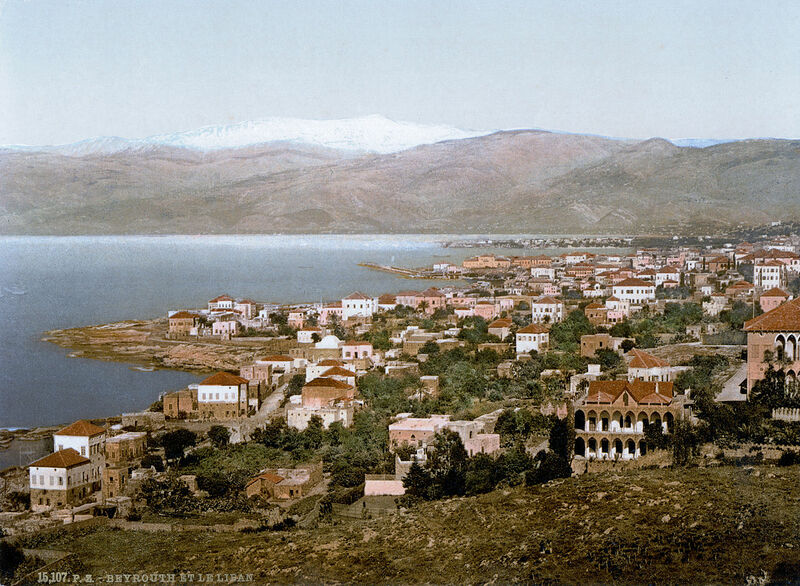 In the early 20th century, large numbers of Armenians fleeing Turkish persecution arrived first at Karantina (an industrial zone in the northeast of municipal Beirut and site of the former maritime quarantine) and subsequently settled in Burj Hammoud just across the Beirut River. Originally swamp and farmland, this suburb became an independent municipality in the 1950s. Burj Hammoud today is one of the most densely inhabited places in the Middle East, with an estimated population of 120,000-150,000 squeezed into just three square kilometers. It retains a strong Armenian character, but at the same time it is one of the more demographically diverse areas in Beirut, as it is home to Christians of various denominations, Shi’a Muslims, Palestinians, as well as foreign labourers and refugees. In the wake of the 1948 Arab-Israeli War, some 100,000 Palestinian refugees were settled in camps in Lebanon, especially on the edges of Beirut, including the Karantina camp which was previously inhabited by Armenian refugees. More Palestinian refugees would arrive later, particularly after the 1967 Arab-Israel War and Black September in 1970. The largest remaining camps around Beirut are in Burj El-Barajneh and Chatila, both of which are located in the southern suburbs and are woven into the urban fabric. Living conditions in these camps are very poor. Unlike the Armenians, who were naturalized en masse in 1924 and integrated into Lebanese economic and political life, the vast majority of Palestinians have not been granted civil rights and face severe employment restrictions and legal discrimination. Video: Life in the shadows: Palestinians in Lebanon – Al Jazeera World, from Al Jazeera English on YouTube. From the 1950s to 1970s, massive numbers of Lebanese from underdeveloped rural regions of the country migrated to the outskirts of Beirut in search of employment opportunities. This phenomenon was already present to some extent during the period of French rule, but the trickle became a flood in the post-independence period. Many of the newcomers were Shi’ites from southern Lebanon and the Beqaa but there were also significant numbers of Maronites from Mount Lebanon. The poorest among them generally settled alongside Palestinian refugees and other low-income populations on the southern and eastern peripheries of municipal Beirut (the so-called “misery belt”), where accommodation was less expensive. Beirut saw enormous growth during this period of time, from about 300,000 in 1950 to 1.2 million with the advent of the civil war in 1975. While all of these peripheral areas may be considered Beirut’s suburbs, the Arabic word al-Dahiya (الضاحية), i.e. “the suburb”, is widely used as shorthand for “the southern suburb” (الضاحية الجنوبية), i.e. the now predominantly Shi’a area to the south of municipal Beirut and north of the airport, extending east to Hadat and Chouaifat. This area, much of it in Hezbollah’s security zone, is approximately the size of municipal Beirut and home to over half a million people. It absorbed successive waves of displaced persons fleeing the Israeli invasions (in 1978 and 1982) and occupation of south Lebanon from 1982 to 2000. A number of old villages lying east of the airport road, now completely urbanized, may be considered the “heart” of the Dahiya, most notably Burj El-Barajneh, Ghobeiri, and Haret Hreik. These are mainly inhabited by Lebanese Shi’ites originating from southern Lebanon. The Dahiyeh also includes some densely populated slum areas (e.g. Hayy El-Sellum, Ouzai, the Palestinian refugee camps) inhabited by low-income Lebanese, Palestinians, migrant workers of various nationalities, Kurds, and the highly marginalized Lebanese Dom (typically referred to with the derogatory term “Nawar”, i.e. “Gypsies”). The areas to the east and northeast of Beirut today have a predominantly Christian population, including towns such as Furn El-Chebbak, Sinn El-Fil, Hazmieh, and Dekouaneh. During the civil war, the coastline from Beirut to Jounieh and inland mountain slopes witnessed a massive construction boom as large numbers of Christians were displaced from the city centre, as well as from Muslim-dominated areas in the southern suburbs and West Beirut. At the same time, most Muslims living in East Beirut and the eastern suburbs were forcibly displaced and relocated to areas under the control of their co-religionists. The Palestinian refugee camps of Tell El-Zaatar and Jisr al-Basha as well as the Karantina slum were completely destroyed. The Muslim population of the eastern suburbs plummeted from about 40% in 1975 to just 5% by the end of the war. The links below take you to our map Local Authorities in Lebanon, where you can click on the blue marker to access more information about the relevant municipality or town. Arnauld, J. (ed.) (1996) Beyrouth, Grand Beyrouth. Presses de l’Institut français du Proche-Orient. Clerc-Huybrechts, V. (2008) Les quartiers irréguliers de Beyrouth. Presses de l’Institut français du Proche-Orient. Davie, M. (1996) Beyrouth et ses faubourgs. Une intégration inachevée. Presses de l’Institut français du Proche-Orient. Davie, M.F. 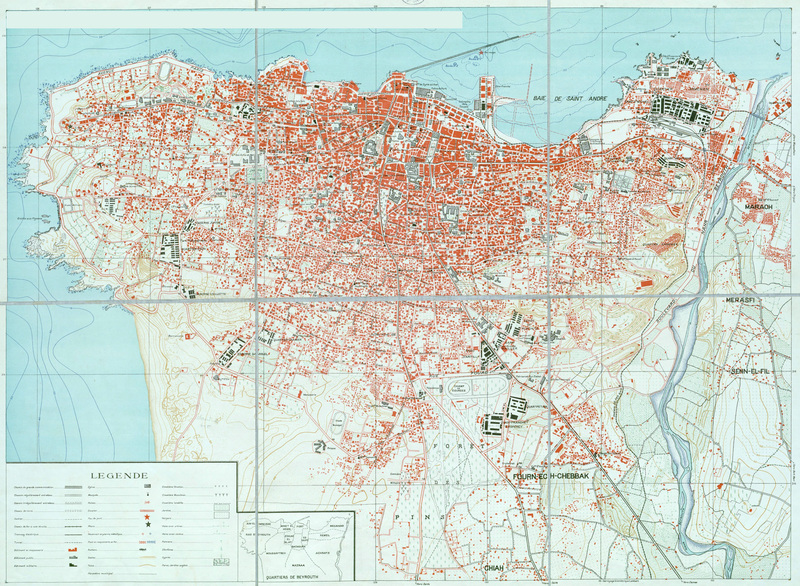 (1987) ‘Maps and the Historical Topography of Beirut‘. Berytus, 35, pp. 141-164. Fawaz, L.T. (2013) Merchants and Migrants in Nineteenth-Century Beirut. Harvard University Press. Fawaz, M. and Peillen, I. ‘The Slums of Beirut: History and Development 1930-2002‘. Understanding Slums. Case Studies for the Global Report. United Nations Human Settlements Programme. Fawaz, M., Harb, M. & Gharbieh, A. (2012) ‘Living Beirut’s Security Zones. An Investigation of the Modalities and Practice of Urban Security‘. City & Society, 24.2, pp. 173-195. Féghali, P. (2009) Le quartier de Sanayeh à Beyrouth. Presses de l’Institut français du Proche-Orient. Hanssen, J. (2005) Fin de Siècle Beirut: The Making of an Ottoman Provincial Capital. Clarendon Press. Kassir, S. (2010) Beirut. Trans. M.B. DeBevoise from Histoire de Beyrouth, first published 2003. University of California Press. Khalaf, S. and Kongstad, P. (1973) Hamra of Beirut. A Case of Rapid Urbanization. E.J. Brill. Khalaf, S. (2004) Heart of Beirut. Reclaiming the Bourj. Saqi Books. Rowe, P. and Sarkis, H. (eds.) (1998) Projecting Beirut: Episodes in the Construction and Reconstruction of a Modern City. Prestel. Sawalha, A. (2010) Reconstructing Beirut: Memory and Space in a Postwar Arab City. University of Texas Press. Sayigh, R. (1994) Too Many Enemies. The Palestinian Experience in Lebanon. Zed Books. Verdeil, E. (2010) Beyrouth et ses urbanistes. Une ville en plans (1946-1975). Presses de l’Institut français du Proche-Orient. Yassin, N. (2012) ‘Beirut‘. Cities, 29, pp. 64–73. 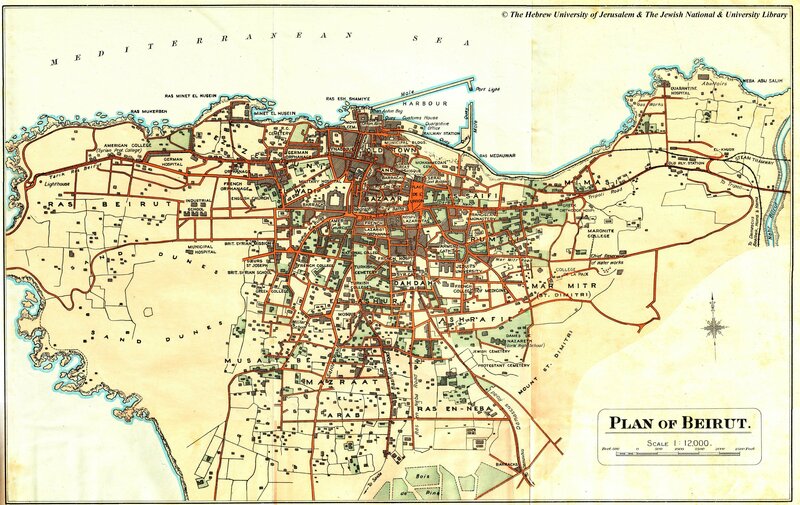 Beirut, 1912 from Baedeker, K. (1912, 5th edn) Palestine and Syria…Handbook for Travellers, first published 1876.